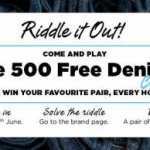 Today we are here to tell you another contest where you can get a free denim pair from jabong called as Jabong Riddle contest. This jabong contest is for privileged users where they will give Free 500 denims. So play contest and win a free Denim Pair. So be ready for contest. Solve a clue every hour and win a denim every hour. but do not worry we will give your clue answer every hour so be ready with us.